Chef Spore is a Toad from the Nintendo Comics System. Appearing in the issue "Bowser Knows Best," Chef Spore is an uptight cook who didn't want Princess Toadstool using the kitchen to cook her father a cake. 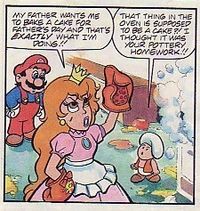 Eventually, he was taken out of the kitchen by Mario and Toad after begging Princess Toadstool to stop baking. This page was last edited on August 28, 2012, at 13:17.